Bunnies are absolutely adorable pets. 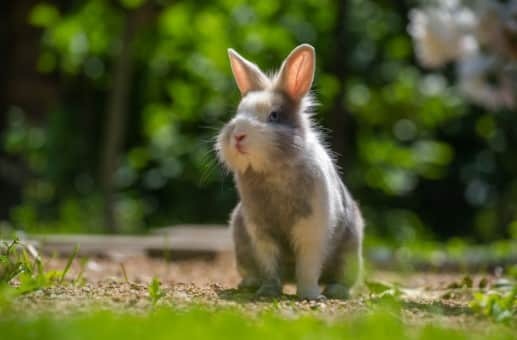 Whichever breed of a domestic rabbit you choose, they will turn out to be furry bundles of joy, as long as you learn how to take care of a bunny. From the moment your new furry pet comes to your home, you need to start acting as a responsible pet parent. In order to help you accomplish this, we’ve come up with useful rabbit tips. Rabbit care is not a rocket science. There are small pets which are way more difficult to look after and much more demanding at the same time. Bunnies need a handful of items including a comfortable home, plenty of hay and water, some chewing toys and regular exercise in order to stay healthy. Wanna know how I did it? Well, before buying Blacky (my all-white Dwarf Hotot) I did a lot of reading and research. I do mean a lot. Thanks to this guide, you’ll spend a fraction of the time getting all the info on how to look after your bunny. Let’s say that you’re getting one bunny to start with. The cage you want is as big as you can afford. That’s the first and the most important item on your list. If you choose wisely and get one of the best rabbit cages, you’ll be buying the cage once only. Bunnies do best in homes that allow them plenty of room to hop, sniff around and play. Rabbits in large cages also tend to be more likely to grow up playful and outgoing because they will feel safe, happy and fit with enough room to play and with constant interaction with their immediate environment and you. When I was buying our first bunny cage, I made sure it met the minimum of 12 square feet of living space. I also checked whether the height was sufficient for the bunny to sit upright on his hind legs and still have enough space between his head and the top of the cage, which is about 2 feet. Don’t forget that the cage needs to be of good quality and have enough space for a food bowl, a spot where you’ll constantly be adding hay and also a corner where your bunny will pee. Bunnies choose a corner to pee and they can easily locate the corner even if you accidentally flip the cage after cleaning it – they will trace the smell of urine so make sure not to put your feeding bowl in the litter corner because your bunny will pee in it. I did see this happen with my bunny so I’m telling you this first hand and I also recommend reading our guide to litter training your per rabbit. The cage also needs to have at least two doors, one on the side and one on the top. Both doors should have safety latches and be big enough to provide easy access to the cage and your rabbit. We keep our cage in the dining room so that our bunny is always in contact with us. He recognizes our voices and feels safe. His front door is almost always open because we let him play in the dining room but we always put the food in his bowl inside the cage. When he gets hungry, he simply hops back into the cage and eats some hay or pellets. His stopper water bottle is also inside the cage. Now, in my opinion, the widely recommended 2-3 hours of exercise is not enough so whenever the weather is good, we take our bunny out to our garden and there we securely tie him using a 10-foot leash and a bunny harness. There he has an additional perimeter of 10 feet around his post to hop and nibble on the grass or simply relax in the shade and enjoy the fresh air. The best rabbit hutch you can afford is yet another option and we have dedicated a special article on the best outdoor rabbit hutches. Letting your bunny hop free around the home brings us to the next point. Bunnies gnaw everything. Period. Even if you get them a specially formulated rock for their cage, the moment you let them out they will get at all the unprotected hard and soft objects. We made a mistake for not protecting our home enough. Our bunny chewed the freshly painted walls, a few bits of armchair upholstering and that’s not all: he went after my laptop charging cable and I had to mend it. Was it his fault? Nope. Rabbits chew, nibble and gnaw. That’s what they do and you need to accept that. If you mind protecting every single object in the room where your bunny is allowed to play freely, you need to keep an eye on him at all times and let him know (we raise our voices) that he's not supposed to chew your shoes, for example. Did I mention he destroyed one of mine? Well, he did! So bunny-proof the part of your home which is his play area and pay special attention to cables so that your rabbit doesn't electrocute himself. 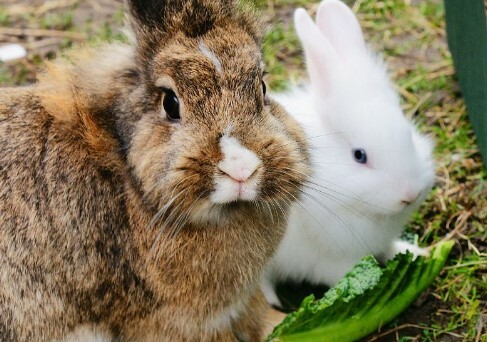 Here are the most important facts about what food should constitute the main portion of the bunny diet and how to care for a bunny in terms of their diet in general. Hay always comes first. You need to provide constant supplies of hay for rabbits. Your bunny can eat it all the time without getting fat. Hay will keep your rabbits healthy. To start with, the large indigestible fiber in hay is much more effective than small, pulverized fiber at moving food through the digestive tracts of your bunny. A high-fiber diet also has a protective effect against all inflammations of the intestines in rabbits. Alfalfa and Timothy hay are a great option. They are cheap and readily available. In addition, hay can be stored for months as long as you keep it well-ventilated once you open the bag. Apart from Timothy hay, other hays recommended for rabbits are Oaten, Wheaten, Pasture, Paddock, Meadow and Ryegrass hays. The only type of hay you need to be careful with is Alfalfa (Lucerne). It’s a legume, not grass and has a higher protein level than grass hay. This makes it too fattening to be the main diet for an average adult bunny. However, Alfalfa can still be good for growing young bunnies and underweight adult rabbits. Your bunny’s diet should be based on the best rabbit food from a trusted manufacturer, fresh hay (timothy or other grass hays), plenty of water and portions of fresh vegetables and fruits. Any other food is a “treat” and should be given in very limited quantities. Good quality pellets as well as seed mixes are readily available and also an affordable option for bunny owners. However, you will need to ration the pellets for adult bunnies. If you give them too many pellets, your bunnies will eat too much get fat. Also, when they are full from pellets, they don’t eat enough hay, which is very bad for their digestive system and general health. A normal portion is ¼ to ½ cup of pellets a day for a 5 to 7-pound adult rabbit. Bunnies which need to lose weight will need more restricted pellets and more exercise. 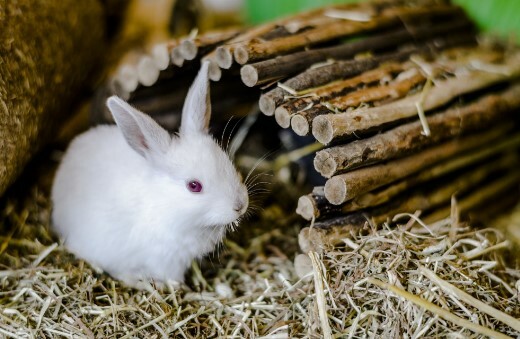 On the other hand, babies or growing bunnies (up to 6 months), as well as ill bunnies need to gain weight so you should give them unlimited pellets along with regular piles of hay and their vegetables. When you gradually decrease the quantity pellets, you need to compensate their nutritional value by increasing the vegetables. Also, a variety of hay must be provided at all times. As for the seeds and pellet mixes, they are also widely available and usually come enriched with DHA, balanced with Omega fatty acids as well as digestive probiotics. They contain pellets, fruits, vegetables, wholesome seeds, grains, nuts, sunflower, oats, wheat, barley, shelled peanuts, safflower, pumpkin seed, flaked peas, flaked carrots, flaked beans, flaked corn, raisins, bananas, pineapple, and papaya. Different brands include different ingredients so make sure to check the label on the packaging to see what the main ingredients are and whether their nutritional value meets your rabbit’s needs. The downside of mixes is that bunnies which are picky might eat some of the content, and leave the bits they don’t particularly like. First of all, however efficient your bedding may be when it comes to absorbing urine and masking the unpleasant odors, you must clean the cage regularly. If you can afford a new layer of bedding daily, I would strongly suggest that you clean the cage by removing the soiled bedding and rabbit’s poo, wash the bottom of the cage and dry it. You can then replace the bedding, add fresh hay, pellets, and water. Wash the food bowl as often as possible. Once a week you can thoroughly wash the cage using mild disinfectant and rinse it well before drying the cage bottom. Also, rabbits poo a lot. Bunny poo is a brownish color, round in shape and it’s about the size of a pea grain. It doesn't have an unpleasant smell until it mixes with urine. However, if you let your bunny wallow in their poo and urine, you are risking their health and making their lives uncomfortable and miserable. Do allocate some time during the day to clean the cage. It will mean the world to your bunny and it will also make their cage look nice and clean in your living-room. 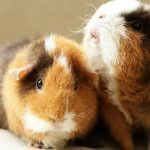 I also recommend reading our best bedding for hamsters, rats, and bunnies reviews for a top pick of a quality rabbit bedding..
First of all, rabbits clean themselves. They constantly go through their fur and remove bits of bedding and food as well as excess hair. Once I managed to accidentally drop the whole daily portion of hay onto my bunny from the top cage door opening. Surprisingly, in less than 5 minutes he was as clean and white as a snowflake. However, bunnies go through shedding cycles a few times a year. At those times of intensive shedding, you should use a brush for a more thorough grooming. Commercial bunny brushes are made to be gentle but effective on rabbits’ coats. It’s important to brush your rabbit to remove all the excess fur. Otherwise, your rabbit could ingest it and have serious digestive issues or illnesses. Besides brushing, a regular grooming routine is clipping your rabbit’s nails. Pet bunnies can’t wear down their claws enough themselves so the nails will grow too long. When that happens, too long nails may potentially curl into your rabbit’s foot, which will cause them pain. In addition, they may snag on something, causing huge discomfort to your furry bundle of joy. Again, commercially available bunny nail clippers are of good quality and affordable for every rabbit owner. Is it difficult to clip your pet’s nails? No, not at all. My 11-year-old daughter does it regularly. She is actually very proud of being able to brush our bunny and clip his nails. She went for the basic training at our local vet’s and he showed her how to do it properly and without hurting the bunny. This brings us to our final tip. Believe me, there isn’t a shortage of good vets who love our small and cute furry family members. Find a local vet who is experienced and affordable and take your bunny for an exam once or twice a year. Being animals of prey, rabbits instinctively hide any symptoms of illnesses so that they don’t look week and easy catch. So, even when you don’t see anything unusual as regards your pet’s health, regular checks are a must. The vet will try to get a recent history of your pet and ask you about any problems, concerns or questions you may have. The usual questions address your bunny’s behavior, diet, and general wellbeing. The exam aims at discovering any symptoms or signs of illnesses but also to confirm a good health, and normal conditions of your bunny. Vets usually check the lips for any sores, abrasions, drooling or swelling. If the rabbit is an adult, the molars are checked for sharp points caused by malocclusion of the upper and lower arcade of teeth. The eyes can be a reflection of overall health and vets check them carefully if your bunny’s eyes do not look perfect. They also check that the ears are clean and not irritated. Any debris should be checked for mites, yeast or bacteria. The ear is swabbed and the material examined under a microscope if necessary. 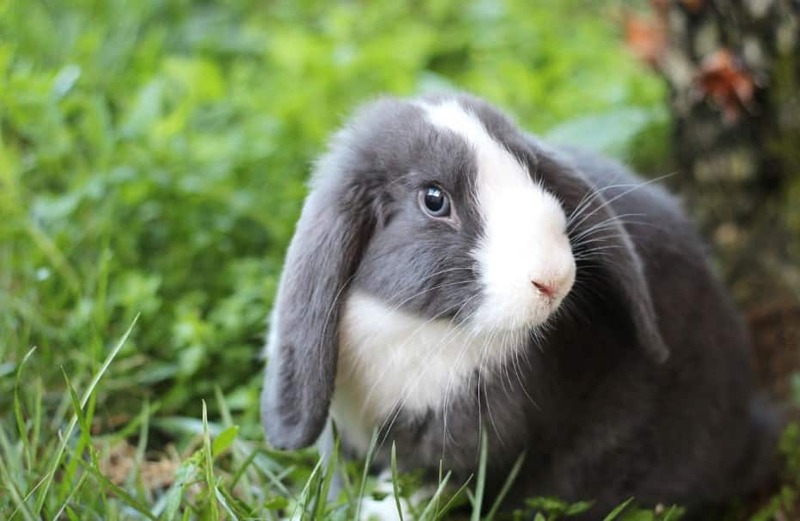 The skin and fur are also examined for parasites, abnormal shedding, or for any evidence that the rabbit has been scratching or biting at himself. Your vet will also check the back of the neck and under the tail for fur mites. The legs and toes are palpated for any abnormal lumps. The doctor will listen to the heart and lungs with a stethoscope and will palpate the abdomen to evaluate size and shape of internal organs. And that’s about it! Pat your bunny and talk to him gently during the exam to soothe him and keep him calm. ***To conclude this article, your bunny needs proper care to stay healthy and happy for many years. These adorable companions do deserve all the moments of care on your part. We do hope you’ll be a great bunny parent and we’ll be thrilled if you leave comments with your experiences, concerns or recollections of memorable bunny moments. 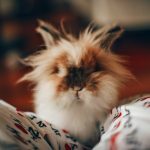 When it comes to the slightly less pleasant matters, like your bunny being a little "hostile", read our article Why does my rabbit bite me? Thanks for the heads up to regularly brush a bunny in order to avoid it from eating its own fur to cause a future digestive issue or illness. In my opinion, owners can also send them to a professional groomer to keep their fur healthy. Doing this will help them keep their lovable appearance while keeping fur away from those with allergies too.